Softcover, 8 1/4 in. x 11 in. A Hands-on Guide To Getting The Most From Your Toyota. The Toyota Truck & Land Cruiser Owner's Bible is the authoritative companion book for your Toyota truck, whether it's a heavy hauling pickup, rugged off-road FJ40, or a new Land Cruiser that's never left pavement. 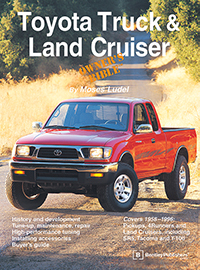 Author, veteran truck mechanic and off-road expert Moses Ludel has written the only comprehensive source of information for Toyota Trucks and Land Cruisers-a history, buyer's guide, service manual, and high-performance tuning book all in one! Discover every aspect of Toyota trucks, from their origins in 1958 to the latest technological advances. You'll learn tips for buying the right new or used truck, and which accessories make sense for your needs. Step-by-step procedures with hundreds of photos cover basic maintenance and more complicated work, like tune-ups, valve adjustments, brake jobs and installing aftermarket suspension/lift kits. Get the hot set-up for your truck, whether you want low-end torque or high-RPM power. Moses gives specific tuning recommendations for engines from the early inline-6s to the advanced 4.5L 24-valve DJ engine. He shares expert insights into the best high performance components and the latest technology from Toyota Racing Development. You'll also find suspension and chassis modifications, and the best tire and wheel combinations.